Tuesday 3/30/2010 at 7am please stop what you are doing and say a prayer. Doctors will be taking Miss Ava for her biopsy at this time. Please pray that the Lord will give these doctors wisdom and that the procedure will go well. Together we can pray towards a miracle for the sweet girl who has captured all of our hearts!! Wednesday 3/31/2010 Miss Ava's biopsy and MRIs went well yesterday. She was up and recovering last night. We continue to pray as results from the biospsy hopefully come today. Please keep Ava in your prayers. Friday 4/02/2010 - Traci, David, and Ava are home for the weekend. They are looking forward to a relaxing Easter weekend at home with their little girl. Please contiue to pray as they prepare to battle this cancer head on and defeat it. 06/13/2011 - "‎"I'm watching a movie with Ava to try and keep her awake. Hoping that she will sleep well tonight. (which hasn't been going so well lately) She still has the feeding tube, but she is doing better eating/swallowing. Last night she was trying to talk to me. I could almost see the words coming out of her eyes and when she would move her mouth, I would just smile and encourage her to say anything. ANYTHING at ALL! Of course, no words came out, but she was able to copy a few sounds, and we all were so happy with that. She was also trying very hard to hold her head up. I just praised and praised her and told her that Jesus and God are helping her too, she just has to keep trying.All the time I would praise her, her little eyes would twinkle and she would just have this huge smile on her face. Every little step forward, no matter how little, is a blessing. I am still trying to cope with my helpless feeling. As a mother, I am supposed to fix everything. Right now I feel like I can't fix anything. She can't tell me what is wrong, even though I have a slew of guesses. I always go down the list of things to help her with. Is she uncomfortable? Do I need to change her position? Is she tired? Is she hungry or wet? Is she in pain?and then there is always the list of things that I already know the answers to...Is she scared? frustrated? confused? angry? I spend all of my days trying to make her comfortable and smile. I try and do therapy with her without upsetting her too much. Meanwhile, I have a million thoughts going through my head of all of the unanswered questions that I will knowingly never get the answers to. I have had to have dreaded talks with doctors, and swallow that lump that appears in my throat throughout the day. I know that I have to be strong for her, because if she sees me even tear up, she begins to cry (just like she always has). I stare at her while she is sleeping just to watch her chest move up and down, and heaven forbid she hold her breath and then my heart starts raising and my stomach feels like I can vomit for the few seconds until she exhales. I guess this is the first real time that I have ever typed, even this vaguely, what I am feeling. Not quite sure what has come across me, but here it flows. I cherish EVERY SINGLE SECOND that I can. I catch myself laying beside her and purposely trying to smell her and "make a memory". I have been told numerous times that God has chosesn us as advocates. I believe it, because I have seen some of what Ava has done to this community, heck this world. But we didn't choose this. We are not trying to be an inspiration for people, although people are so sweet and say we are. We are just trying to be the best parents that we can be and do everything in our blood to save our angel....mind, body and soul. Good afternoon everyone! I actually had a few minutes where I have time to sit down and type, so I wanted to post an update on Ava. First of all, I want to say a huge thank you, once again, to all of her supporters. 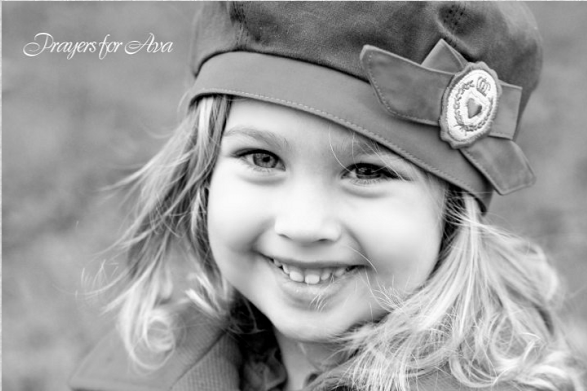 People throughout the Mid-Ohio Valley community, and all across the world, pray for Ava every single day. There is no doubt in my mind that the Lord is hearing each prayer and, slowly, answering them. We are living our lives in our "new normal" and embracing each morning giggle with a smile spread across our faces. Ava is still sleeping in her new bed in our room. Hope is sleeping on her bed each night and Ava wakes us up every single morning with the sound of beautiful giggles. One of the most important things that has been happening is that Ava is really starting to be vocal again. This all started last Thursday and has only progressed. She still isn't saying any words, but there is a LOT of gibberish, and it is absolute music to our ears. For the past few months, I was getting the impression that she was scared to try and talk, to try and make any sound. Now that she is sitting there jabbering, and we are praising each sound, I believe she has gotten over this fear and we may FINALLY be making progress in the speech area. There has been a few times that we swear she has said Dad and Mom in these past few days. Let me tell you, when you haven't heard your child's voice for over 4 months, it is unable to describe the emotion to just hear their VOICE again, to hear what they used to sound like, even if it isn't making any sense. Her Physical Therapist is very happy with how well she is doing. She is holding her head up better and better each day and really using her trunk muscles to help herself sit up. Of course she still needs assistance in both of these areas, but every day she is trying harder and getting stronger. I am overwhelmed with amazement for my daughter. She is the strongest person that I know, without even knowing she is doing it. There are times that I think about if an adult had to go through everything that she has been through. Losing her ability to walk, twice. Losing the ability to use your arms and hands, twice. Losing the ability to sit up, hold your head up. Losing the ability to talk. Be honest, who wouldn't give up? Who wouldn't be pissed off at their situation every single day and not have a single tear left to shed for themselves? I can't say that I would blame them at all. And here is my 6 year old daughter, who although she can't actually say it, is obviously showing us that she isn't giving up. It is that natural wonderful instict that God has put into our innocent children to keep going, to be fearless and not even consider rolling over and just "taking it". You cannot teach that. I wouldn't know where to begin to. Thank you God for filling my daughter with this "instinct". Not only is she still fighting every day to be able to do the simplest tasks that she used to be able to do, but she is fighting for her life, and she is never going to give up. Ava is still taking her chemo every 21 days and then has her 7 day break. She is still taking her seizure medicine numerous times a day, along with other medications. She is currently on a round of antiviral medication to help her since she was, unknowly, possibly exposed to the chicken pox. She is taking every medication like true champ. We still have a home nurse come once a week and do Ava's labs through her port. Her numbers have been down, but not too bad. We just have to be extra careful, like always. The chemo made her lose some of her hair, but some is already growing back. Overall, she is holding her own. Please come and check these out. This is the first of many annual walks! I know that I have been scarce on here, and I apologize. Ava was sick for about 4 weeks with a horrible nasty cold. I actually believe that it started with allergies, but all of the crud just got stuck in her throat since she is unable to clear her throat or blow her nose. The poor girl was coughing from the top of her head to her little toes and there was nothing we could do. We were giving breathing treatments, using vicks, have a dehumidifyer by her bed, a suction machine, allergy medicines...ect ect. And then to top it off, when she first got sick, David came down with strep throat the same week. He was about as sick as I have ever seen him. So, I was on MAJOR nurse and sanitizing duty! HOWEVER, it seemed to work because Ava did not ever get the strep throat (knock on wood). While Ava had this crud, she also started school. At first I thought that maybe school had been a mistake, because she seemed just miserable. But things are going better. I'll tell you more about that later. I am just so glad that Ava is feeling better now. We still have some coughing every now and again, but over all she is doing good. Her coughing spells were so intense that as soon as she had one, it would completely wear her out. She would be utterly exhausted from it, so therefore she was sleeping all the time. Add that on top of the fact that she was having a very hard time swallowing with everything in her throat, and so she lost weight. What scares me is that the extreme fatigue and troubles swallowing could also be symptoms from the tumor. Seeing her feel miserable and not have the energy to hold her head up (which she had beed doing quite well) had this mommy very worried and in many tears. I'm just so glad that she is feeling better, staying awake more, and acting more like herself again this days. We have started therapy at the school now and still at home. Since she was so sick, she lost so much strength in her neck and trunk muscles because we couldn't even make her try and do therapy. The good news is that the therapists don't see any regression in the rest of her body, just holding her head up, so they don't think it is from the tumor. Hopefully with more work she can get back to where she was....holding her head high. So now that Ava is feeling better and, still tired some, but happier, let me tell you about school! In these past few weeks she really seems to be enjoying it! We go 4 days a week and the kids LOVE HER! This shouldn't be a surprise to me because kids are so accepting, but there was some major anxiety about what might be said. There have been a few incidents when a child has innocently made a comment, and I have told David, I'm pretty doggone impressed with how well I have handled it:) The biggest challenge now is how to make all of the many kids who want to hold Ava's hands the whole time happy. Ava just loves the attention. I'm to the point now that I can just leave her in a group of kids and they are holding her hands and talking and making her laugh and I just smile. This is what she needs. Ava has always been such a social butterfly-----those children are the best therapy I could get her. The best feeling of normalcy I could give her. So even though I feel like I am in school again (starting over in Kindergarten:) every second is worth it to see Ava's eyes light up when her friends come running over to her and want to help push her around in her new wheelchair. Or when the kids want to just sit beside her and "read" her a book. It warms my heart. I guess this has been plenty long enough (probably too long for most of you), so I will wrap it up with the fact that Ava seems excited for Christmas. She enjoyed putting our tree up with me (actually just holding the ornaments for me, but whatever) and we talk about Christmas all of the time. Ok, I talk about Christmas, she just smiles. (we are still working on trying to get her to say more words). And as I layed in my bed the other night, it popped into my head that it is almost Christmas time. So I began to pray, as I have everyday since, that we can have a Christmas miracle for Ava. I know it is asking alot, but we are not giving up hope, and now is certainly the time to have it. Hey, if the Brady Bunch could have a Christmas miracle, why not us? I hope everyone has a Very Merry CHRISTmas and a safe Holiday season! God BLESS! There hasn't been a lot to update on Ava recently, but I at least wanted to check-in with everyone. Ava is doing about the same as the last update. She had a wonderful Christmas, where Santa was VERY good to her and Happy New Year that she got to ring in with her best friends! She even stayed up past Midnight! We enjoyed our break off of school and are getting back into the swing of things again. We are still working on getting her muscles strengthened so she will be able to hold her head up on her own again. She still seems to be gripping well with her left hand and some in her right. Unfortunately we are not seeing much movement with her legs though. We are having to really watch what textures of food she is eating, although she has started drinking well from a straw again in this past week. Right now my days are focused on therapy (with therapists and then just me doing some at home throughout the day), school, trying to get as much food and liquid down her as possible, medicines and making sure she gets enough sleep. (Exhaustion can make a seizure more likely to happen, so I don't like "keeping her awake" when she is tired) The girl just keeps growing taller and taller! This is a wonderful, if I could just get some weight on her. Every week we do labs, and I always get nervous about the results, and now I am equally as nervous for her weekly weigh-ins. I know if we can't keep her weight steady or put weight on her, then the feeding tube is a huge possibility again. I want to do everything in my power to make sure she doesn't have to go through that again, even if that means me sitting and feeding her for however long a "meal" takes. It just breaks my heart how skinny she is, but it is good to hear that she is well hydrated and her labs and electrolytes look good. I know also that she is losing muscle, so that is some of the weight loss as well. Lets just put it this way, she is getting to eat A LOT of milkshakes of various flavors (little does she know they are made with Ensure). David and I decided to take her out to eat at Outback tonight. We went to the mall and walked around for awhile and then went to eat. We had a LOVELY night. Ava used to get incredibly excited to eat at a restaurant, and since her stroke, we hadn't felt comfortable enough to take her to one. I'm not sure why we decided it was time, but it was the right decision. We had her in her wheelchair, right up to the table. We were coloring and she got to eat mashed potatoes off the menu. I even made sure to order some cheesecake to bring home for her tomorrow. Some of you may have seen the picture that I posted on here of the new addition to our family that is coming. Although I wasn't exactly keen on the idea, David was begging me to get another Min Pin puppy. I told him he was out of his mind since Hope (our Yorkie) is still a puppy and we already have Annie (our Chocolate Lab). Well, he knows how this game works and he quickly got Ava on his side. Ava is such an animal lover, especially her dogs. When I am unable to squeeze one more smile out of that girl, all I have to do is bring a dog up to her and she lights up. Any time David would mention this new dog, Ava would get the most excited look on her face....now come on....how do you say no to that!? I mean, my heart is not made of stone and David was well aware of this. He may not admit it, but I am well aware of his plan....and well aware of how well it worked haha. So this Friday, we are calling to see if our new 5 week old puppy is ready to come to her new home, where she will be well loved, and is bound to fall in love with Ava. I will make sure to attach the picture of her again on here. Now as for Mommy. Let's see. I have certainly had my days. Different kinds of days. Over-all the Holiday season was happy for us. I had my moments, like when we were at my Parents house Christmas Eve, or at David's grandma's Christmas day. I found myself looking at all of Ava's cousins, who are absolutely amazing with her, but I would realize I was sad. Sad because Ava should have been up playing, running around and screaming with them. Telling all of her Aunts and Uncles about the new toys Santa had brought her. Telling me that she didn't want to eat because she was too busy playing. I long for the days when I had to tell my child to settle down. That there was no running in the house. That we need to not scream or sing to loudly. That she needed to move her dance party or concert to the side of the room so people could get around her. That she needed to let people open their own presents because she wanted to "help" everyone rip the wrapping paper off. I wish I would have had to tell my child that she had gotten up too early on Christmas morning and that Mommy and Daddy needed a little bit more sleep. Trust me, all of these things are things that I NEVER thought that I would MISS doing, but I desperately do. Sometimes it seems that everyone else just doesn't realize how darn lucky they are. WHAT I would do to have the normal problems of parenting again. And let me tell you, I appreciate those parents that have made a point to tell me that through us they have learned to cherish those moments and their children more. Because that is what I want to do. To shake people and tell them sometimes. I know it is harsh, and maybe I am COMPLETELY wrong in thinking this way, but I just want to tell people sometimes..."you think you have problems? Let me tell you about problems. We have problems, and yet I am still well aware that there are many people in this world who are worse off with problems than us." I guess this paragraph comes down to this, I appreciate people who count their blessings. Everyone has those moments of self-pity, this is only human nature. But it is people that pick themselves back up afterwards and try their best to look at the blessings in their life that I admire. I know many people like this. Friends, Family and strangers, and my hat goes off to you because this is what I strive to do myself. I'm sorry I haven't gotten to write an update on Ava since asking for extra prayers. To be honest, I have to be in the mood to write these notes. I try and push down all of my feelings in my everyday life to live as normal as I can for Ava. These updates make me take that wall down and I just have to feel ready for that. I have been saying for the past 2 nights that I was going to write and update, and I just wasn't ready. Then this morning I had her note 1/2 written and my computer rebooted and didn't save it! ugh. So here we go, draft #2. I guess it mainly began last weekend. David was working nights, so Ava and I were here by ourselves. On Sunday night Ava had a couple episodes where she was gasping for breathe. It would only last a few seconds each, but it was as if she was choking or her lungs just weren't working properly. Her eyes would go wide with fear and her limbs would tense up, similar to a seizure. All I could do is get right in front of her face, hold her cheeks and hands and tell her Mommy is here and to breathe. Combine this with the additional symptoms that we have seen arise and I was terrified. We have noticed that at times, especially when she is tired, her pupils are different sizes. This size difference is due to pressure from the tumor, and we know that. They are still both responding well to light though, so that is good. I had noticed over the weekend that she was having a lot of difficulty swallowing, another symptom of the tumor. This had me worried for many reasons. I was having trouble getting her medicines down her. She was having trouble eating, and we are desperately trying to put weight on her. I thought for sure the feeding tube was going to be essential. We had noticed that she had been very tired, another possible symptom of the tumor. She just seemed like she wanted to go to sleep and was exhausted all of the time. I know sheer boredom is probably to blame for some of this too. We are stuck in this house because it is so cold out and Mommy is only so entertaining after awhile to a 6 year old. As much as I try to entertain her, reading her books, playing barbies, dancing and singing to her, ect....I think she just gets tired of me after awhile! I had also noticed that she was having trouble sucking from a straw, yet another symptom. We had been having a very difficult time getting any reactions out of her. No smiles, no laughter, not even an eye widening or brow lift. I started to really feel like she was suffering and this tore my heart out. So put these all together, and I was beside myself with fear. Because of where her tumor is, it controls all of the things like eye movement, swallowing and breathing. I know that many DIPG children pass away in their sleep, they just stop breathing. So by Monday night, when I posted the prayer request, I had seen her do the gasping thing a few more times. David was working his last night and I didn't know whether I should call him to come home. So I did what I knew as a mother to do. I held my baby. I rocked her in the chair for almost 5 hours. I cried with her in my arms. I talked with her about Jesus and God yet again and how wonderful Heaven is. I talked about the new baby Braxton that I know she can't wait to see and hold. And when she fell asleep, I just rocked her more. I could feel that she was breathing as I held her against me and this calmed me. I asked for the prayer requests and then I brought her to our bed and she slept with me that night, up against me again so I could feel her chest rise and fall. No parent should have to feel this fear. The fear that at any second your baby may be gone. The constant tightening in my chest if I had to run to the bathroom and running back to make sure she is breathing. The many times I get up every night just to see if she is breathing. The fact that I am worried to ever go to sleep. Ava has a tendency to hold her breathe while she is sleeping, and so I will just kneel down and stare at the sleeping girl until I see her chest rise again. One of my biggest fears is that something will happen when I am not there. I am the mother. I should ALWAYS be there for her. Unfortunately I can't hold her 24 hours a day, and so when I am not, I worry that something would happen and that I will never forgive myself. It is a horrible fear and weight hanging over my head every second of every day. Thank you everyone. Together, in prayer, I honestly believed you saved her this week. I was preparing myself for the worst. And although, we are not naive at what is happening, I feel these past few days she is doing better and better. Slowly, but she is not where she was last weekend. And that is really all I can ask for right now. The past two nights we have had some of her friends come out, and I think this is going to be a more frequent event. The kids entertain her WAY better than I do and she enjoys it. It gives me a break and they always get her laughing. God love them. world rally together in prayer, and I have seen God's hands at work. suddenly last week, out of nowhere, I changed my mind like that. two choices, either do nothing or put the feeding tube down her nose. it be done asap? I don't know...at least I didn't at the time. have slept through the process because she was so tired. relief. We didn't know if we would ever see her open her eyes again. Ava. Meanwhile, I had made my last post on Facebook and it soared. peace. It looks like God has listened. gotten any reactions from her yet. out of the house for a minuted. Bless him. 03/13/2012 - Sweet Ava passed away today. There will be a candle light vigil on 3/14/2012 at 8PM in Dodge Park. Please bring your own candle. "She impacted so many lives and was an angel among us. Now we will celebrate her life and continue our never ending battle to fight this awful disease"
"Ava Cole Nichols, 6, of Waterford, died Tuesday (March 13, 2012) at her home with family and friends by her side. She was born Aug. 26, 2005, in Marietta, daughter of David and Traci Sampson Nichols. She attended Waterford Elementary. She loved to sing and dance and play with her dogs, Annie, Faith and Hope. She is survived by her parents, David and Traci Nichols of Waterford; grandparents, Mark and Nannette Sampson of Beverly, Keith and Sally Nichols of Waterford; great-grandparents, Lovell and Goldie Sampson of Beverly; great-grandmother, Jean Zimmerman of Caldwell and great-grandmother, Donna Fogle of McConnelsville; several aunts, uncles and cousins. She was preceded in death by great-grandparents, Muarl and Willadean Nichols and great-grandfather, RD Fogle; her aunt, Kate Weinstock; and "Uncle" Steve Lauer. A private family service will be held at 11 a.m., Saturday, at the Beverly United Methodist Church with Pastor Jeff Corbett and Evang. Zack Waite officiating. The visitation will be from 3 to 9 p.m., Friday, at McCurdy Funeral Home in Beverly. In lieu of flowers the family would like donations made to St. Jude's Children's Research Hospital. Online condolences may be made by visiting www.mccurdyfh.com."